I'm doing an essay on the concentration camps, but I can't figure out wether they had the death camps, labor camps, and all the other "camps" in one big concentration camp but in seperate areas of it or were they all a ways away from eachother and considered their own camp? Best Answer: By following this link, you will discover camps were located all over Europe, including North Africa. The concentration camp was re-invented by the Nazi's following the internment camps the British set up during the Boer War. The first, Dachau, was established in 1933, the same year Hitler became Chancellor. It was set up as a work camp to punish those who did not follow Nazi doctrine, were a threat to the regime, were homosexual, religious leaders, or who needed re education. Buchenwald and other camps were constructed shortly afterwards. The death camps, Treblinka for example, were constructed simply to kill people. Off the train, into the field, through the forest and into the gas chamber. No real selection process for camp labour or anything else. No chance at life. The labour camps, Auschwitz/Birkineau for example, were a combination extermination camp and labour camp. Labour from Auschwitz/Birkineau (two camps in the same area within close proximity) supplied labour to the IG Fabren plant, a chemical plant considered necessary for the German War Machine, kept many jews and others alive for a short period before they died from starvation or such diseases as typhoid or dysentery or sent to the gas chambers. Auschwitz as an extermination camp, most arriving on the transport trains, particularly in the later years, went directly from the trains to the gas chamber. I encourage you to also look at the link Reinhard concerning the extermination camps of Sobibor and Treblinka. A link is also supplied concerning the operations of Auschwitz/Birkineau, it is the last link listed. I also encourage you to read Night, by Elie Wiesel which is a short book but covers his journey from Hungary to Auschwitz to surviving the death march when the camp was evacuated. It is on Oprah's Book Club. Mr. Wiesel is one of the most prominant survivors of the Holocaust and well respected by historians. Anything by Martin Gilbert, or Sir Martin Giblert is also very credible. Perhaps these two are the leading experts on the Holocaust. The Nazis were very systematic in organizing the various camps. I was born in Poland after the war and raised in America. During the summer of 2007 I spent time in KrakowI and met a Jewish man, Bernard Offen, during the annual Jewish cultural festival. He showed a movie about his childhood experience in Poland. (He lives in Hawaii for 6 months and Krakow for 6 months.) Bernard said he lived in the Jewish area of Krakow, Kazimierz, when the Nazis invaded in '39. Then systematically, the Jews were expelled from that area, and sent to the Krakow Ghetto and from there to Plaszow, a concentration work camp. Some of the concentration camps were holding or work camps and not known primarily for killing like Auschwitz-Birkenau was. I didn't think I'd hear from Bernard after that summer, but the day that Pope Benedict came to America I got an email from him about his new published book "My Hometown Concentration Camp" Check to see if you're local library has this book because Bernard can explain the Nazi Concentration Camps better than I can. Good Luck. All camps were death camps. Some were also labour camps. Eg. Treblinka and Sobibor were almost purely extermination camps. There was very little work done there, most of the transported people were murdered on arrival. the selected survivors were put to work sorting the collected clothing, luggage, gold teeth, eyeglasses. In some camps the nazis collected skin- especially tatooed skin. Some camps had a more "humane" reputation than others- these were mostly for political prisoners who were not always murdered- Dachau which was in Germany itself had such a reputation. But another- Stutthof- was used for experiments in making soap out of human fat. Good question. Concentration camps were located inside Germany and were first created in 1933 (Dachau). While people undoubtedly died there, they were not extermination camps. 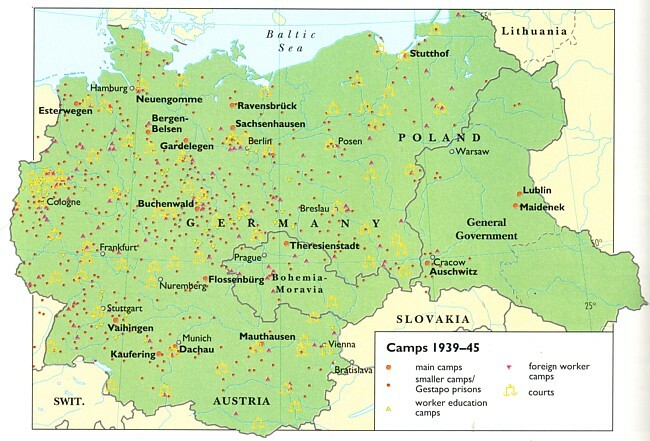 Death camps were located outside Germany, mainly (if not all) in Poland, and weren't built until 1941/1942. They sometimes had labour camps attached to them, but these death camps were specifically destined for exterminating large numbers of people. They were spread out all over Europe. There were many concentration camps. People died in all of them. Generally, the concentration camps were the labor camps. Sometimes during the war, they did purposely kill in them, however. Nazi concentration camps number ? Which was worse: Nazi concentration camps or Soviet Gulags?